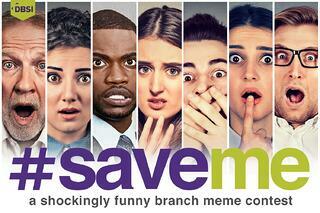 Part 4 of #SaveMe: A Guide to Painless Branch Transformation and contest! Branch Transformation can be a perilous process, like navigating a maze with a giant boulder careening your way. . .
Big decisions need to be made (“What technologies can best help us? How can we better support a Universal Associate model?) and the wrong path can spell disaster. Plus the pressure of tackling Branch Transformation on top of all the other aspects of your job can really push stress levels to their upper limits! Luckily, Branch Transformation doesn’t have to be that stressful. Having a defined path is a lot easier than wandering aimlessly through the forest. DBSI uses our own 6d process to help guide our client’s to Transformation: Discover, Define, Design, Document, Deliver and Debrief. But that doesn’t mean Branch Transformation is a cookie cutter process. For example, before design even gets started, we know that asking the right questions and discovering your differentiation and your transformation intent, among other factors, are key to getting the right design for you. The right guide can make all the difference. . . just ask the Donner party. So would you trust a guide who didn’t understand banking to lead your Branch Transformation? Oftentimes, our clients have already spent months working with architects, without getting the results they were looking for. That's because Branch Transformation is about more than where to put walls and what your branch looks like. It’s about how it will operate and serve clients, efficiently and effectively, and accomplish your strategic intent. That's why DBSI has specializes in Branch Transformation and a full range of comprehensive services, for a wholistic approach that ensures every part of Transformation works together to achieve your goal—from the space, to the technology, staff training and more. And it's why we offer innovations with the aim to improve the branch experience and profitability, from self-service to digital sigange. Getting the budget right on your transformation can also help prevent stress in the future. Big budget surprises might drive up the drama on HGTV, but they’re a major stressor in real life. No one wants to spend more than they were expecting. So how can you prepare for everything that needs to be included in your Branch Transformation? We offer our clients a Smart Budget Tool to help them plan for every part of Transformation: so they can get an accurate cost with the right amount of contingency, in case unavoidable expenses do come up. Or browse some of our favorites on Instagram, Facebook, Twitter or LinkedIn for inspiration. Then send it to us to be entered to win!